Rugby Union - Old Crocs v Malton and Norton. 'Ryan Hammond for Crocs. Old Crossleyans showed Roundhegians that they were a different proposition to last season with a 38-15 Yorkshire Two success at sunny Broomfield on Saturday. For most of the 80 minutes new player coach Ryan Hammond had his side playing high tempo, error free rugby at a pace and intensity that the opposition struggled to come to terms with. The visitors took the lead with an early penalty but that was the first and last time they were in control of the scoreboard. New recruit Scott Caley was solid under the high ball, beating defenders and off-loading to Nav Sembi to barge forward. 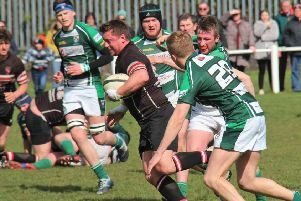 Continued pressure in the final third saw Rob Oliver go close and a Gareth Sweeney penalty levelled the scores. A destructive tackle from debutant Joe Gallagher forced a turnover and his probing kick was followed by breaks in the midfield from centres Jack Hammond and Lewis Sharpe. Rob Oliver and Ryan Hammond off-loaded after line breaks, before a quickly taken penalty enabled Ryan Hammond to force his way over from close range and Sweeney converted. Cameron Brannan caught the restart and carried aggressively, setting up Jack Hammond to break the line once more. Oliver ensured continuity but an infringement at the breakdown released the pressure. However, a clever pass from Gallagher to Oliver unlocked the defence and a Sweeney penalty made it 13-3. Both Hammonds were excellent in attack, and featured heavily in the build up to the Crocs’ second try. Quick recycling enabled Oliver, who was everywhere in the opening 40 minutes, to cross. Sweeney converted to it 20-3 in a frenetic first half that saw the fitter home side in a different gear to their opponents. Crocs restarted on the attack. A rejuvenated Shane Davis caught the ball and ran off the tail of a lineout, linking with Oliver to create pressure that led to a home scrum five metres out. No 8 Ryan Hammond attracted several defenders before off-loading to scrum half Craig Heppenstall, who sprinted in under the posts. Sweeney converted. The visitors established good field position and put some width on the ball. Full back Thorpe showed tremendous pace to beat the outside Crossleyans defence and set up an unconverted try for winger Jackson in the corner. A good tackle and strip from Gareth Sweeney prevented more Roundhegians points and good carries from Ollie Coyne and George Hammond was followed by a good clearance from Gallagher. Yellow cards were issued to both sides after a reaction to a late tackle on Heppenstall, but it was Crocs who were next on the board with a Sweeney penalty after James Wainwright had carved up the middle from a set play. Heppenstall was yellow carded by referee Nia Parsonage, who herself was having an excellent match, and Roundhegians scored a converted try off a driven lineout. Down to 13 men, there was textbook game management from Gallagher who organised the forwards to keep possession before landing a well taken drop goal. Back to a full complement the home side saved the best move of the match until last. Gallagher’s accurate wide cut out pass hit Lewis Sharpe. He straightened and off-loaded to Caley, who beat one defender and drew in another before off-loading out of the back of his hand to the experienced Wainwright, who outpaced the cover for the bonus point try.